Posted on October 5, 2010 by Deli Lanoux, Ed.D. 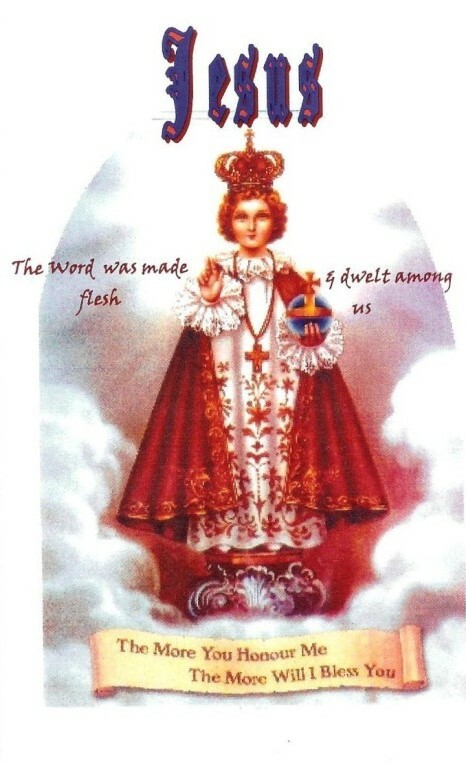 Early in September I searched for links to the Holy Infant of Prague and found one particularly interesting, since it offered the means through which one could request a relic of the Venerable Margaret. 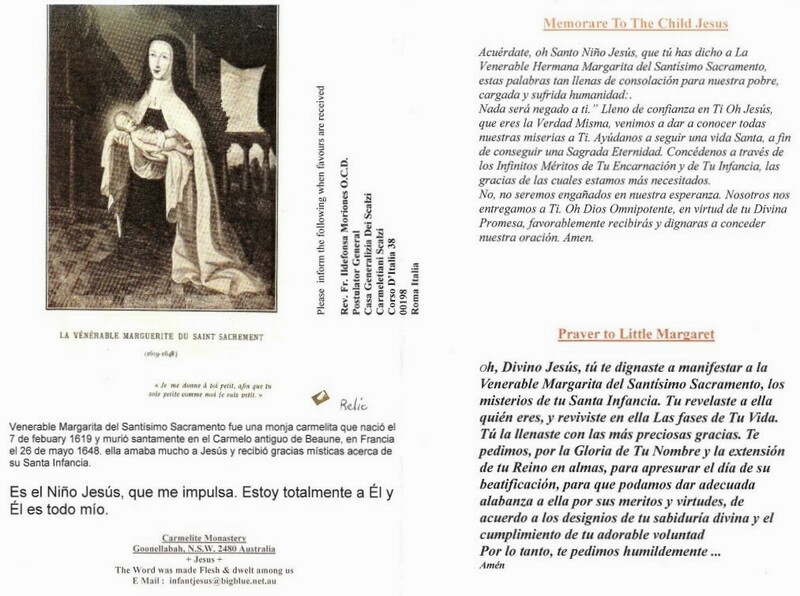 Although I’d never heard of the Carmelite nun associated with the Holy Infant’s chaplet, I bookmarked the site, Devotions to the Child Jesus Around the World, before starting an email to Ana C, its webmaster. Only I didn’t send the message right away. I placed it in my draft folder instead and went off in octopus mode as usual. For two weeks the “draft (1)” reminder on my Yahoo’s left sidebar beckoned until it screamed so loudly that I finally sent the email. Within hours I received a response from Ana C, asking to confirm my mailing address. My packet would be mailed from the Carmelite monastery in Australia, and I could hardly wait! Surprise, surprise! Even though I’d been expecting the packet, I’d never thought it’d arrive so quickly. I was over the moon with joy that Sister had included a lovely note. Praised be Jesus Christ! Thank you. 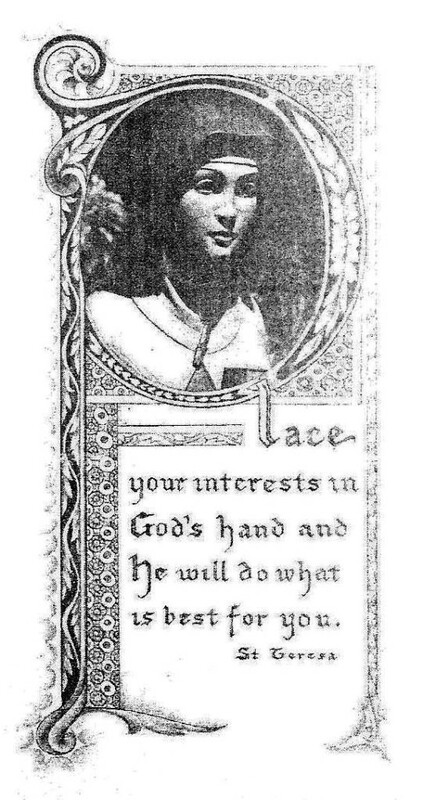 I have enclosed a relic card of Little Margaret (as I call her). The relic is on the Spanish card, but I have enclosed an English copy also. 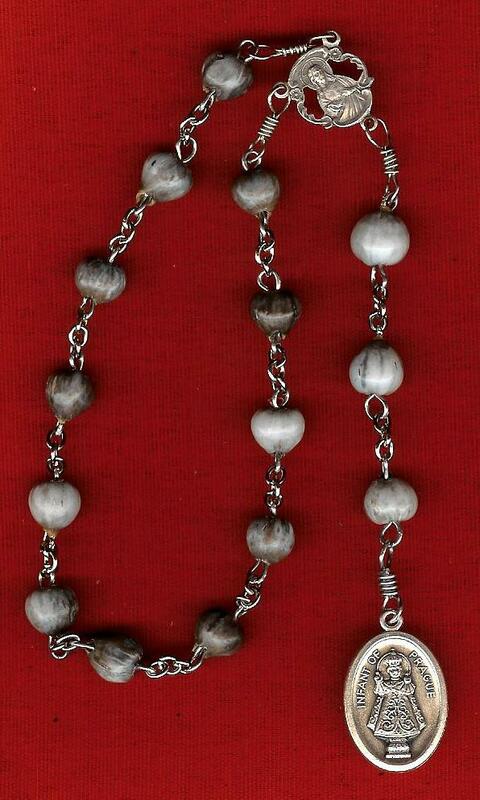 I have also enclosed a chaplet of the Child Jesus that I made. Please carry it with you. Little Margaret is helping many people all over the world. I have put your name under the Child Jesus and am burning a lamp for you daily and continuously, asking Little Margaret to help you and to intercede for all your intentions. A detailed book on her life, entitled A Gem from the Diamond Mine, is available. With love and prayers, gratefully in Jesus…. I emailed Ana C right away to thank her. What a glorious, extraordinary surprise to find a small packet in the mailbox this afternoon! I had no idea who it was from until I turned it around and saw Australia on its back side. WOW!!!!!!!!! I couldn’t believe my eyes! I was overjoyed!!! It took just one week to receive more than I’d ever imagined. Everything is just so beautiful. I intend to write to Sister to thank her for the wonderful surprise! She sent so much!!! What a treasure-trove! Thanks so much for posting the information on your website, as I wouldn’t have received my gifts had it not been for you. God bless you infinitely much! Sister emailed, thanking me for the message that Ana C had forwarded to her; and a few days later, Ana replied. I am very happy you are pleased. Actually, for about one year I was the one mailing out the relics that Sister would send me; but this year I don’t have the time to keep up with the numerous requests, so Sister is mailing them herself. She is very generous. She also offers objects for sale (beeswax candles, which she makes; and a book, A Gem from the Diamond Mine, which is the biography of Sister Margaret) to help raise funds for her convent and her ministry. She wants to see Sister Margaret raised to the altar of the saints. You may want to consider sending her a small donation, if this is within your means. She will never ask for a donation, but I’m sure it can get costly mailing relics from Australia to the U.S. It’s up to you and just a suggestion. Thank you for your email about my site. In the future I am planning to take a web developer course. I have plans for my site to reach more people. So far I have had visitors from many countries in Europe, Asia, and South America. It has been a true blessing! Since then Ana and I have emailed back and forth, and she made a couple of suggestions. About Sister, maybe send her an email and ask her which way she would prefer to be contacted? I’m not sure. As for donations, I have sent her checks before; and she can cash them. Just a thought, if anyone wants to send her any in the future. Thank you so very much for your prayers! They sure have made a difference! 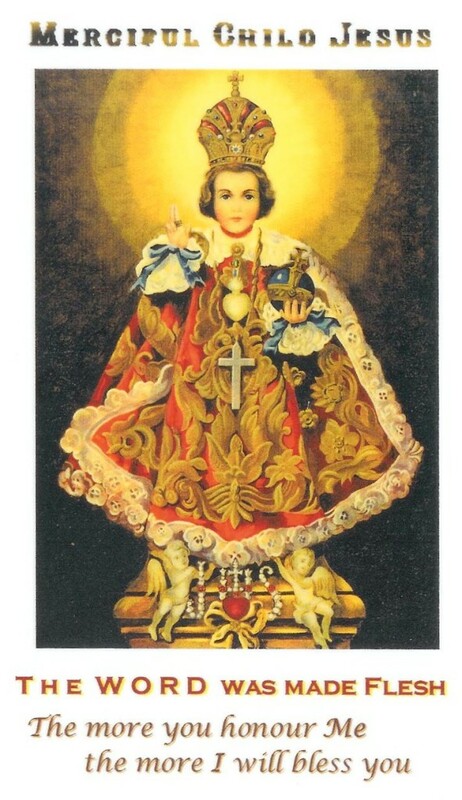 Like you, I’m a devotee of the Holy Infant of Prague. Isn’t he a darling child?!! I have a question for you… Since I want very much to share the packet with those who read my WordPress blog, I’m wondering if you’ll allow me to post your contact information. 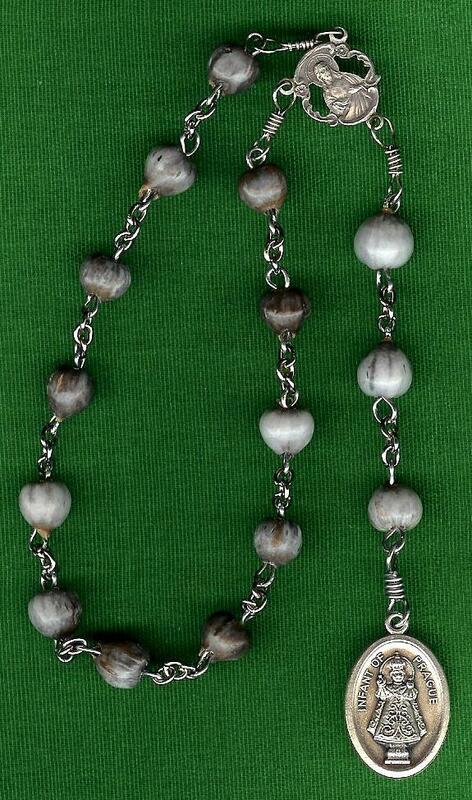 This way, anyone interested in requesting a chaplet can do so. Your monastery has a contact page, so I intend to include that link on my blog. May I post the email address that accompanied your packet? Again, thank you so very, very much for my wonderful, glorious surprise! It’s a treasure-trove that I’ll cherish for a lifetime! Thank you, and I am happy that you have received my little parcel. Our Lord has told us that, unless we become like little children, we will not enter heaven. When I entered Carmel fifteen years ago, the first thing I remember being told was that, when we enter heaven, it will be the Child Jesus that will lead us in! I owe my vocation to Him. He is everything to me. I would very much or, rather, He would like his bride Little Margaret to be known and bring honor and glory to his holy childhood. A detailed book on her life, entitled A Gem from the Diamond Mine, is available. I would like that book also to be known. Gail Hodgson is the one who got the book reprinted and updated. You can share the package on your blog, but please do not mention my name. The email address is okay. The Infant Jesus has promised to grant special graces, especially purity and innocence, to those who carry the chaplet with devotion, especially children who need it very much at this time. May the Holy Child Jesus bless you and Steve and all your loved ones abundantly. So, if anyone wishes to contact the Flower of Carmel Monastery, please keep Sister’s request in mind. Little Margaret… O divine Jesus, you deigned to manifest to Venerable Margaret of the Blessed Sacrament the mysteries of your holy childhood. You revealed to her who you are and relived in her the phases of your life. You filled her with the most precious graces. We beg you, for the glory of your name and the extension of your reign in souls, to hasten the day of her beatification so that we may give fitting praise for her merits and virtues according to the designs of your divine wisdom and the accomplishment of your adorable will. We therefore humbly ask you. Amen. Draw from this divine heart. Ask all that you desire through the merits of my holy childhood. Nothing will be refused to you. Full of confidence in you, O Jesus who are truth itself, we come to make known all our misery to you. Help us to lead a holy life in order to attain a blessed eternity. Grant us through the infinite merits of your incarnation and of your childhood, the graces of which we are most in need. No, we shall not be deceived in our hope. We abandon ourselves to you, O omnipotent God, that, in virtue of your divine promise, you will favorably receive and deign to grant our prayer. Amen. I also am blessed with this beautiful… sacred… devotion. My petition every day is for the convent with Sister to receive, not me. Thank you, God, THRU CARMEL. Amen to that! Sister has been a sweet inspiration! I, too, thank and praise God for his angels at the Flower of Carmel monastery. We are infinitely blessed to be graced by their thoughts, prayers, and friendship. Thank you, dear Klaus. One can never have enough good wishes from others. I think you have a poet’s perspective. Sweet, hopeful. Always looking for the silver lining. Always with a kind word to brighten someone’s day. I wish you abundant blessings… love, health, happiness, wealth… and all that your heart desires! 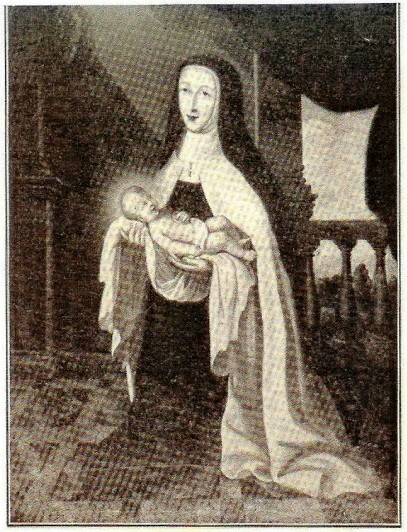 I would like a relic of Venerable Margaret Parigot. Can anyone suggest the email address where I can request a free relic of Venerable Margaret Parigot? Just contact the Flower of Carmel Monastery in Goonellabah, Australia. The address is on the “Venerable Margaret” post as well as on the “Card credits” page. Or you can contact the Carmelite sisters via their website also listed in the credits. They are very nice about responding, though your request may take some time. P.S. Should you have any difficulty please let me know so that I can write to Sister for you.